A 2,000,000 square foot residential project along the Red Sea in Yanbu, Saudi Arabia was underlain by approximately 2 meters of dense sand and gravel, which was in turn underlain by loose silty and clayey sand, and clay. The groundwater table was approximately 8 to 9 feet deep. The project consisted of two to four story residential construction, principally villas and townhouses. Fourteen lots of 5 acres each were set aside along the Red Sea for members of the Saudi Royal Family. 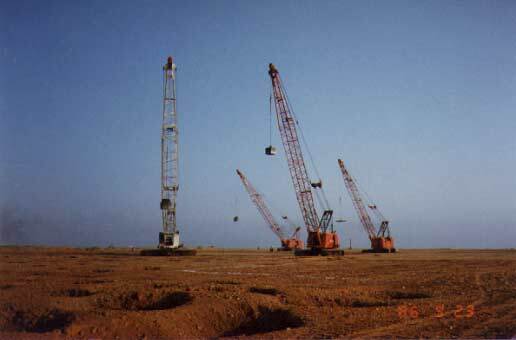 Dynamic compaction was performed using weights of 13 to 16 tons dropped from heights of about 60 feet. Work was performed 20 hours a day, six days a week for approximately 2 ½ months. Testing was performed by our personnel using SPT, CPT, Menard pressuremeter and laboratory testing. The specifications required that the Schmertmann settlement technique be used to calculate settlements under design load. The maximum allowable settlement was one inch under a bearing pressure of 2 ksf. The dynamic compaction was complicated by the presence of a 6 foot thick clay layer, however, compaction was achieved both above and below the clay layer. In addition, the laboratory testing indicated a slight increase in the preconsolidation pressure in the clay.